Today's Look: is all about making the transition from summer wardrobe to fall wardrobe. Since summer is coming to an end, soon shorts, sandals, and spaghetti straps will be retired for a few months. In fall, jeans, boots, sweaters, and scarves are the staple items for the chilly days to come. To be able to make the transition, I am slowly changing from bright colors and skin-baring clothes to more subdued hues and warmer clothes. 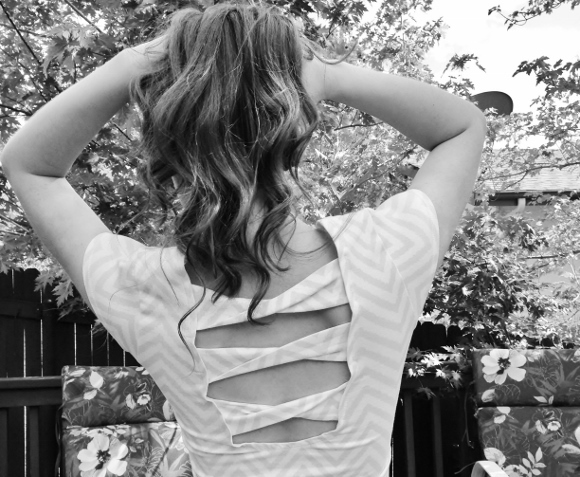 To start the look off, I chose a chevron, formfitting mini-dress with short sleeves, and cut-outs in the back. 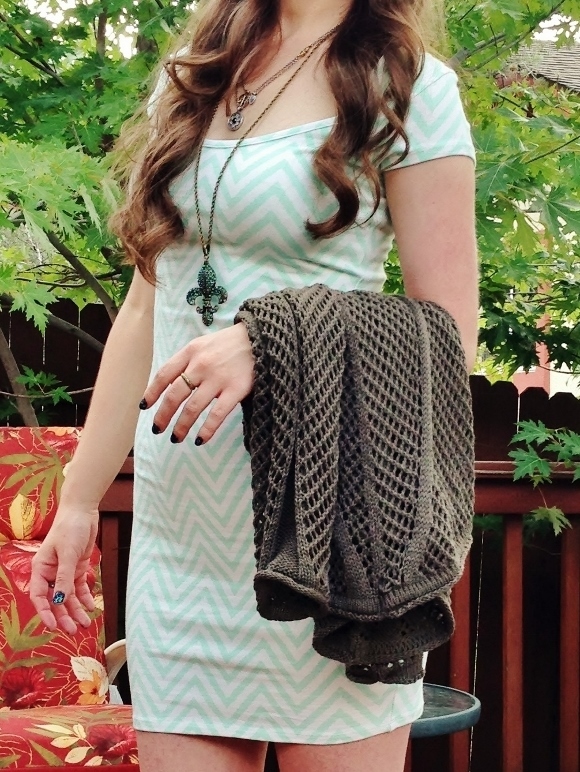 Since the dress is short and summery, I wanted to darken the look somehow, so I chose an army-green, baggy sweater. I like how the sweater is loose, but not overbearing. Next, I chose my suede, taupe wedges, because they went nicely with the sweater. Finishing off the outfit, I accessorized with multiple necklaces, one consisting of a fleur-de-lis charm with turquoise and brown crystal detailing. Lastly, I selected a green, patchwork purse to bring together the different colors of the dress and sweater. Outfit Details: Dress c/o Charlotte Russe ❤, Sweater by Monoreno at Fancy That (Prescott, Arizona), Shoes by Jessica Simpson at Dillard's (Prescott, Arizona), Purse from World Market, Short Necklace by Lucky Brand at Dillard's (Prescott, Arizona), Rings from Aeropostale (Scottsdale, Arizona), Fleur-de-lis Necklace was a gift. Fashion Tip: When transiting into fall, comfy sweaters are essential. 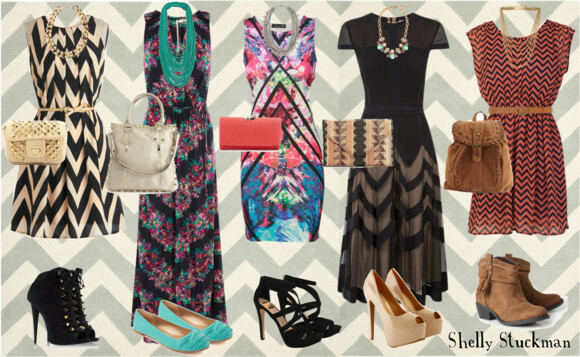 Below, I included more chevron dress outfit ideas and the link to find them. 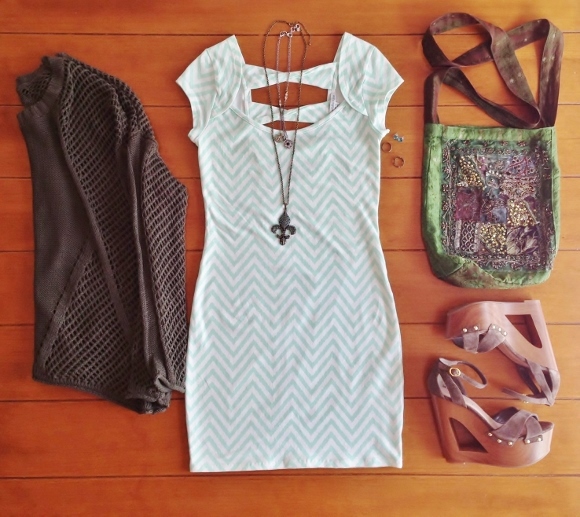 Dress, Shoe, Purse, and Necklace links found here. Came across your blog, thank you twitter! LOVING your style, so effortlessly chic! 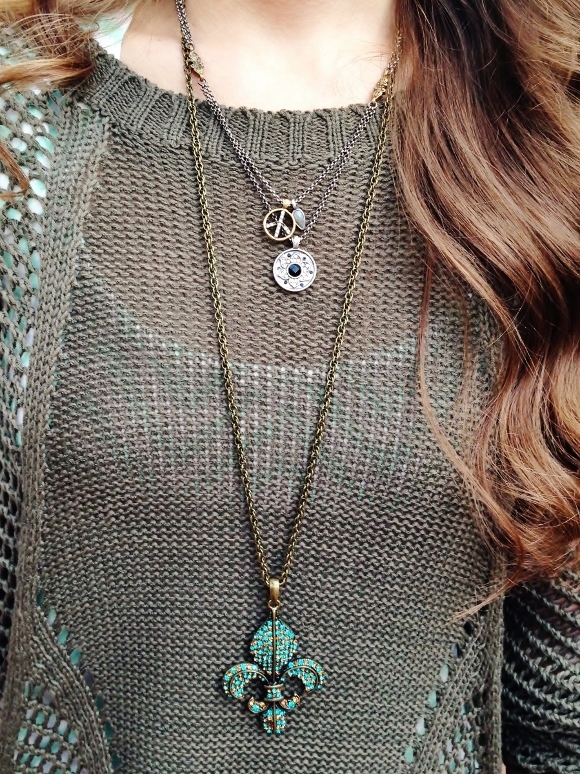 Really like your fleur de lis pendant as well!